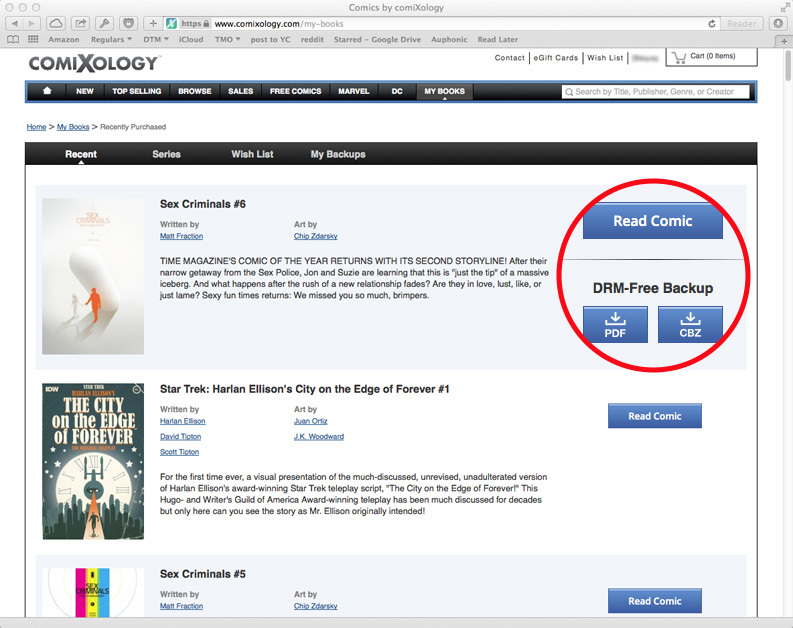 Amazon's digital comicbook distribution company comiXology announced on Thursday that is is now offering customers DRM-free copies of the comics they buy for backup. Users can download PDF and CBZ versions of the comics they have already purchased, although not every comic sold is available. PDF is a standard and ubiquitous document format from Adobe, and CBZ is a popular digital comic file format. For our launch, participating publishers include Image Comics, Dynamite Entertainment, Zenescope Entertainment, MonkeyBrain Comics, Thrillbent, and Top Shelf Productions. In addition, our Submit creators and small publishers are now able to choose to make their books available DRM-free. Big name publishers Marvel and DC are missing from that list and there hasn't been any word yet on whether or not titles from either company will be available in the future. You'll need to pay a visit to the comiXology website and login to your account to download previous purchase backup files. You can find your purchase history in the My Books tab. comiXology recently drew the ire of many digital comic fans for pulling in-app purchasing from its iPad app. The decision came after Amazon bought the company, and while many readers don't mind using the comiXology website to buy titles, the change made it much more less convenient to browse comics or impulse buy. Offering PDF and CBZ versions of comics for download doesn't take away the sting of losing in-app purchasing, but it is great for customers because now they can have their own purchase backups, and the files can be viewed in any compatible app on any platform.